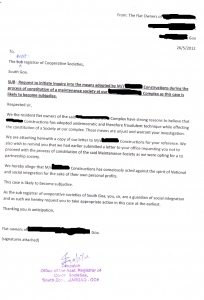 Goa News |Towards a Non-Cooperative Society!! This is the true story of a 140 flat fully residential housing complex in South Goa. Five and a half years back I happened to purchase an apartment in this entirely residential complex with stilt parking and five buildings with landscaped surroundings. The complex was the first of its kind in South Goa. It has a swimming pool, a gym, a club house, round the clock security, intercom, six elevators, generator back up for common lighting and perimeter lights, and a children’s’ play area. I purchased the flat just as the construction of the first building was about to commence. The builder had taken five years maintenance charges at INR 1000/- per month. INR 60,000/- total. In the first year there was no swimming pool, no gym or common lighting and the builder’s construction laborers used to double up as security. When eight or nine families came to stay in the complex we decided to form a committee. This committee approached the builder and gave him in writing our first request to constitute a true Cooperative Housing (Co-partnership) society in the complex without individual sale deeds. We had purchased the flats on the basis of agreement of sale. The builder assured the committee that he will do so as soon as more people join. In the meanwhile after a lot of negotiations with the builder and some not so pleasant arguments, the committee succeeded in improving the quality of security. As more and more people poured into the complex the committee continued its regular meetings and gave the builder a set of recommendations. The builder in his typical reassuring style ignored most recommendations. However the committee managed to get the swimming pool functional by the end of the second year. After a lot of “baba-puta” the builder finally moved some primitive gym equipment into the premises just enough to keep our bodies in shape. The committee patted its own back at its ability to breech the builder’s impregnable fort and decided to make persistent attempts towards formation of a true Housing Cooperative Society without individual sale deeds. In this type of society the entire land with all common facilities is conveyed by the builder to the cooperative society headed by a properly elected committee. The committee also asked the builder for contact details of all his purchasers so that they can be contacted and informed about this decision of the committee. Builder assured the committee of his full cooperation but gave no written reply to the committee’s letters. Days passed by. More and more people came to live in the complex. Gradually the 140 flat complex was getting transformed into a mini India. Goans and non-Goans started living in harmony. The builder continued to maintain the complex at just acceptable level paying no heed to the committee’s recommendations. Meanwhile a property expo commenced in New Delhi. The builder put up a stall there and sold a large number of flats to non Goans whose sole intention was to give the flat on rent or to keep it vacant for them to come and enjoy Goa during vacations. Gradually the number of non Goans in the upmarket complex increased, most of them being high income people from the metros. One day I chanced to meet the builder at a party. As a member of the committee I felt obliged to ask him how the process of society formation was progressing. “They want to make individual sale deeds!” said the builder with a concerned look on his face. I was flabbergasted! “Have you asked the members who are the permanent residents of the complex?” I enquired. “That is not necessary” he said flatly. I was floored once again; but I decided to be a little persistent. “Individual sale deeds in a complex like this are akin to each and every state in India being declared a sovereign nation. How can such a complex be managed by any committee if the committee is left toothless to tackle defaulters and non residents?” I continued, “moreover it will finally be the Goans and the permanent residents of the complex who will have to manage the complex. Why don’t you take a meeting of the people of the complex and ask them?” I asked. “I will definitely take the meeting at an appropriate time.” assured the builder. I felt it was inappropriate to continue the discussion which could have led to a confrontation at somebody else’s party. So we shook hands and parted. Ours was a splendid committee. Headed by a senior Goan. It included non Goans one of whom was a young real estate agent, dependent on the builder for supply of flats and yet willing to take him on for the sake of a cooperative society. At one of our meetings this real estate agent brought us the news that the builder had clandestinely commenced calling each purchaser to his office for the purpose of individual sale deed. The committee took a strong, written objection to this and reiterated its recommendation that a true co-partnership society be constituted in the complex. The letter also mentioned that if the builder was not willing to undertake the process himself then the committee was ready to conduct the proceedings on its own, provided the builder handed over the contact details of the flat owners and a letter indicating that he had no objection to the conveyance of the land and common facilities to the society. The builder, as usual, did not reply. Days went by. 0ne day a senior person of our building, who lived a floor above me, knocked on my door. He was known to be the builder’s man for reasons best known to himself. He was a non Goan but was on a transferable job in Goa but wanted to buy and keep a flat in Goa. “Doctor, your committee is not doing any work!” he said. “Why bare you saying so?” I asked him. “Builder has told me that he is not proceeding with the society formation because you are confronting him” he said. He immediately convened a meeting of the people in the complex and told them that he is on good terms with the builder and can get the society done fast provided he was chosen the leader under whom the committee approached the builder. The committee took objection to his approach but agreed to go with him to the builder. In our committee there was one particular bright, young Goan entrepreneur. I call him “Arvind Kejriwal” of our complex. That invariably increases his chest circumference by an inch. He stood by me in this entire struggle for the cooperative society. One day he came running to my clinic. “He took them to the builder saying he will convince the builder to make a society but there he agreed to the builder’s request for individual sale deeds!” he said panting. “And what about the common land?” I asked. “Who has the title of the land then?” I asked. “The builder continues to hold the title to the entire land” he said. “It is called maintenance society,” he said with a tinge of sarcasm in his tone. “The only logical type of society I know is a cooperative society,” I said. “Anything other than a cooperative society is obviously a NON-COOPERATIVE SOCIETY! !” I exclaimed. “And that is an inherent paradox. How will it function?” I questioned. “We must not agree to individual sale deeds” I told him. He agreed and passed on the message to most Goans and the non Goan permanent residents of our complex. Most non Goans however were non residents and wanted individual sale deeds. Meanwhile the builder continued with his spree of phoning and calling the flat owners to his office for individual sale deeds. The permanent residents of the complex were still not ready to make sale deeds. “In Goa, yes!” he said. “This will benefit the non resident investors of the complex and make the maintenance of the complex by residents impossible” I remarked. “Our committee had written to the builder that there are NO FIRE ESCAPES IN THE COMPLEX nor is there any fire fighting equipment installed. How did the buildings get occupancy certificates?” I asked. “Can the registrar of cooperative societies intervene?” I asked helplessly. “There is a difference between a house and a HOME” I said, “the builder has only built houses but we have built our homes here. We have greater right to the complex than the builder once the builder has sold the complex. Our right to choose our destiny is compromised by the existing legislation” I maintained. Days went by. Individual sale deeds were clearly to the benefit of the non Goans and the non resident Goans who were quite gleeful about the builder’s decision. They did not have to contribute to the complex if they did not want to. The committee had no teeth to implement its will and the builder was the king of the complex. As soon as 71 sale deeds were executed the builder announced that a Chief Promoter had been “elected” and that he had given an affidavit on our behalf to the Assistant registrar’s office that he will get all of us to execute individual sale deeds. This Chief Promoter was the builder’s man who lived one floor above me. “When were the elections conducted in our complex?” I asked our “Arvind Kejriwal”. “Then it is about time India changed its National Slogan from “Satyameva Jayate to Asatyameva Jayate! !” I thought to myself. It is then that I realized that LEGALITY DOES NOT ALWAYS ENSURE MORALITY. Existing laws should be re-examined to determine whether they guarantee morality of justice to Indian citizens and not just cold blooded, partisan legality which smacks of underlying corruption. There is no need of two types of societies in Goa at all. It is imperative that the so called “maintenance society” be scrapped with immediate effect. Only the true Cooperative (co-partnership) Housing Society should exist in Goa as is the case with other states of India. The GOA STATE CO-OPERATIVE HOUSING FINANCE & FEDERATION is located on 3rd FLOOR, GOMES BUILDING, OPP HOTEL DELMON, PANAJI. Tele 2222232, 2229865, 2220092 and e-mail . In Goa, there is a CO-OPERATIVE HOUSING SOCIETY and there is a CO-OPERATIVE HOUSING MAINTENANCE SOCIETY. You can download the Goa Co-operative Societies Act 2001 & Rules 2003 from the internet. You can also get copies of the bye-laws of both types of societies from the office of the federation. There is no such Federation in Goa to the best of my information. To have such Federation it is first necessary to give a clear legal mandate to the builder to constitute a Real Cooperative society. Maintenance society must be scrapped in Goa. This is the duty of Govt of Goa vis a vis 97th Amendment to the Constitution of India. I read your excellent article which almost is similar to what we are facing. Our complex is ready and now the builder has left to us to form a housing association. Also he has individually approached the owners to make sale deeds. Many of us do not know the rules of co-operative hsg soc and housing association. Since most of the owners are abroad, and many do not have sale deeds, it has been decided that the best option is to go with the housing association. Few members out of the 160 flats have got together to first draft the rules and regulations. I read your article and the comments on the same, I would like to know if there is a GOA STATE COOPERATIVE HOUSING FEDRATION which can guide owners so that they do not have to face any hassle from builders and in future from any problems. I would say easier option is all of you get together , surrender your sale deeds and constitute a true Cooperative society. 97th amendment to India’s Constitution of 2012, makes the right to form cooperative societies a fundamental right of Indian citizens. Its aim was to “enhance public faith in cooperatives” and protect them from “avoidable political or bureaucratic influence”, by making co-operatives a fundamental right under Article 19(l)(c) of the Constitution and inserting article 43B that states should promote co-operative societies. To avoid transferring land to the democratically and voluntarily constituted coop society what the builder lobby did was it got a "maintenance society" legalized from Govt wherein the builder forced each flat owner to make individual sale deed thereby giving only a notional right to undivided land to the flat owner. "Maintenance society" provides a legal loophole where conveyance is not made in the name of the registered society. Existence of a legally valid "maintenance society" enables the builder to "maintain" the title of the land and thereby forces the flat owners to "maintain" the builder's land for him. Individual mutations are neither practical nor meaningful. Further to my earlier comments, the formation of a Maintenance Society appears to be a 'fait accompli' in our 224 apartment complex since many owners have already signed individual sale deeds by which conveyance of respective apartments along with undivided proportionate share of the land is envisaged. As per details in Form ‘D’ of the Property Card of Panaji City, the legal holder of the land is the builder. With a view to protect the future interests of buyers by ensuring that the title of the land legally passes on to us (and not just remain a notional transfer), would anybody know whether 224 mutations (subsequent to each individual sale deed) can be incorporated in the land records? Also, if 224 mutations are feasible, in any subsequent sale by any individual owner, will concurrence of other 223 holders of undivided land be necessary? I will answer the most important part first. I still stay in the complex as it is very close to my bungalow and I can literally coexist, if I may say that, in my bungalow and this flat. Builder has managed to thrust a maintenance society upon this complex by forcing or tricking the majority to make sale deeds. The complex is now being run by a committee constituted by the builder himself. The people who comprise the committee are those financially or in some other way dependent on the powerful builder. They however do not have a Chairman. The chairman resigned before the completion of the term of the provisional committee for reasons best known to himself. The one year term of this provisional committee expired in April. However the same people continue running the complex. Their meetings are in their flat or outside the complex, secret. No general body meet has been called for last 15 months. No other complex resident seems ready to join the builder's committee or ask for a GBM. I am not a member of this maintenance society as I have not done my flat's sale deed like many others. I have not signed any other flat or society related documents except the Agreement of Sale. I have myself requested the existing committee for constitution of a proper cooperative society, but they did not respond. Thank you, sir, for your interest. Thanks for exposing this problem with excellent article. So before I or many other people fall in such builders trap, could you please tell us what has been done now in your complex? its still a "Maintenance Society"? ?who takes the decision?is everythng working fine in the complex? Most importatnt, do you still stay in same complex or you have come out of it for such torture from builder? @Mahesh Jadhav, your idea of Goa State Cooperative Housing Federation is a very good idea. In delhi we have citizen welfare association. each coloney is divided into blocks and each block has a welfare association. for example Greater Kailash 1 A block welfare association, B block, c block.... All block assocations are members of coloney assocation that is Greater Kailash part I welfare association. All such assocations are societies registered under societies act. Sheela Dixit Govt runs the Bhagidari Scheme under which all the coloney assocations of delhi are connected with the delhi Govt. The assocations do collective bargaining with govt. MLAs and Corporators attend block assocation meetings and so do officials of electricity, water and other municipal council officers. That is why there are basic amenities at micro level in delhi. Looking at size of Goa one single federation is sufficient. infact on similar lines all the communidads, panchayats and devasthans should also form their federations. method is simple if mla does not work people do not vote for him. I had gone through the entire episode of Dr.Mukuls horrifying experience with the Builder. I suggest to take this task to the end by coming together and by forming a GOA STATE COOPERATIVE HOUSING FEDRATION. All the Cooperative Housing Socities in the state of GOA who are facing the similar problems may become member of this fedration. The fedration will bring sense of togetherness and the problems faced by the office bearers of the COOP HSG SOC and each individual flat owner can be resolved by pressurising Government of GOA to pass the legistlation of Conveyance Deed by builder in favour of Cooperative Housing Society within stipulated time period. Governments can adopt the same MFOA adopted by the nebouring state of Maharastra where a builder has to convey the ownership of entire project land to the society within three months or the same land is deemed to be conveyed in favour of the society. The society therafter take the responsibilty of managing the show. This is high time to form a FEDRATION right now. Im ready to render my assistance for this noble cause. This is a situation everywhere in Goa. Same story with me too. Most of the apartments in Goa do not have Co-operative society, due to vested interest of builder. Nor the laws are in peoples favor. Due to non-formation of Co-op. society, maintenance of building becomes difficult. Thus most of the housing apartments are in debacle states in Goa. Also hygiene cleanliness, water supply, repair leakages is a big mess. We Goans are too responsible for the whole mess, coz we don’t want to come together and resolve our problems. Just imagine we all apartment owners, who are struggling for formation of co-op society, unite to together and make a representation to govt., High court , is it not possible to do it ? how many of us are ready join hand to channelize our anger, sufferings, frustration, mental agony to demand justice or just leave a comment on this blog that’s it ? I don’t know legally is it possible or not , coz iam not a expert, but a "HOME" owner suffering in hands of builder. And there are many, thousands and hundreds of them like me and Mr. Mukul, suffering quietly…. Excellent article, Dr. Mukul. The narrative of your personal experience in the context of a larger problem was gripping as well. As a NRG (non-resident Goan) living in Pune, I see and hear similar cases of builders circumventing the law and shortchanging home owners. While Maharashtra has a single co-operative society Act, I believe it is not mandatory, leaving builders the option of going the 'apartment' route, not dissimilar to the 'maintenance societies' of Goa. It seems that the builder-politician nexus is pan-Indian in nature and 'Amche Goyn" is no exception. The building sector, a core component of a nation's infrastructure, might be the only one that is unregulated or regulated inappropriately. What we need are better laws (moralistic as you have pointed out) that protect the interests of home owners rather than the builders. An important reason, apart from the lax laws, as to why builders manage to enforce their writ is the age-old British policy of divide and rule. Ergo, if the flat owners in your society had been largely united, you might have been able to pressurize the builder to form a cooperative society. As a society, we, the people, are progressively reaching the pinnacle of I-me-my family-my relatives-my friends-my ward-my state-my country social structure; the aim being to get to the top of the wealth ladder without caring for the welfare of the society at large. It is this narrow-minded, bigoted attitude of individuals that is at the root of a divisive and weak society. The selfish attitude of the non-resident investors is but a testimony of our attitude to morality and the empathy (or lack of it) towards our neighbours. It is sad to see this group of people invade Goa as well, slowly eating into the moral fabric of the state. Do I see the home owners' troubles ending soon? At the risk of sounding pessimistic, I don't think so. The problem is that the unholy alliance of builders and politicians cuts across the boundaries of political affiliations. Doesn't matter which party is in power, the builder lobby will always get their way. Add to this the deep-rooted penetration of corruption in our society, and we can easily see why builders get away with what they do. What we need is a public movement that will force the government to act in favor of home owners. With the 'housing-complex' wave reaching Goan shores (something which is happening in villages as well), there is no better time to do this than now. Hopefully, Mr. Parrikar will look into this matter and enact the necessary legislation. Thanks for raising an important topic.